French President Jacques Chirac bowed April 10 to the pressure of millions of students and workers marching across France and withdrew a hated law granting employers the right to fire a young worker at will for up to two years after he or she is hired. The law limiting the labor rights of youth under age 26 was rammed through with no debate last month by Chirac and Prime Minister Dominique de Villepin, who claimed it would reduce France’s chronic double-digit unemployment. But the law ignited street protests of up to 3 million youth and their worker allies. Hundreds of university campuses, high schools, factories, offices and other workplaces were idled by nationwide strikes. Villepin poured fuel on the protest with his arrogant refusal to meet and discuss the draconian law, claiming it was essential to modernize France and make it competitive in “globalized markets.” Finally, after weeks of rising fury, Chirac was forced to withdraw the law, known as the First Jobs Contract (CPE). Solbes, who participated in the movement and who serves on the higher education committee of France’s largest union federation, the CGT, said the marches, rallies and strikes were “filled with joy and solidarity.” The youth now are less doctrinaire than in 1968 when a similar uprising of students and workers swept France, he said. Although Villepin has denied he harbors presidential ambitions, both he and his rival, Interior Minister Nicolas Sarkozy, have been considered possible successors to Chirac. But polls indicate that Villepin’s approval ratings have plummeted to 25 percent, a drop of 16 points in just the past month. Chirac’s ratings have also fallen to 25 percent. Sarkozy is hoping to capitalize on their woes. 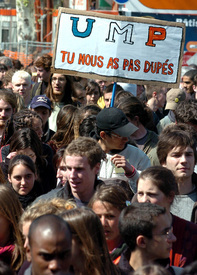 But students in Paris carried a banner that read, “Villepin, we got you … Sarkozy, you’re next!” They also vowed to remain vigilant in their defense of labor rights, with some demanding that a similar law that applies to enterprises with fewer than 20 workers, the CNE, also be scrapped. Writing in the FCP daily, L’Humanite, Jean Lojkine debunked the corporate media for interpreting the student-worker uprising as a case of “insiders,” older workers who enjoy job security and benefits, against “outsiders,” marginalized younger workers.